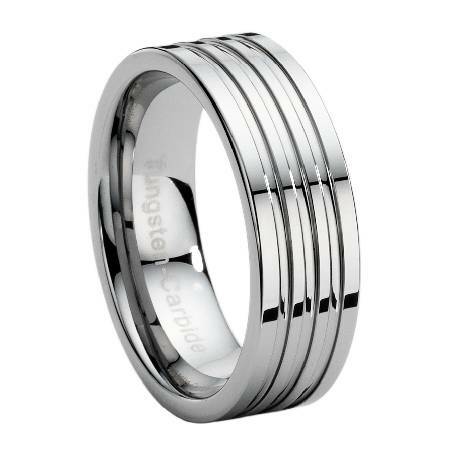 This designer Tungsten ring has three grooves carved into the ring to give a multi band effect. A good-looking ring at an affordable price. Comfort fit tungsten rings usually run 1/2 size larger, it is suggested you buy a half size smaller than your standard ring size. We recommend having your finger measured for a comfort fit ring at your local jewelry store for an accurate fit. All of our tungsten rings come with a lifetime warranty. We ordered this ring not knowing what to expect we it arrived. What a pleasant surprise. The ring looks great, has a nice weight to it, and fits perfectly. I definitely recommend this ring and Just Men's Rings.